Government consultation on measuring child poverty. So, what’s that about? The Government are currently developing “better measures of child poverty” to provide a “more accurate reflection of the reality of child poverty”. 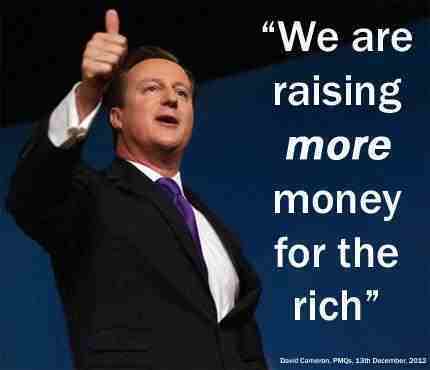 According to the Tory-led Coalition, poverty isn’t caused through a lack of income. The Coalition have conducted a perfunctory consultation that did little more than provide a Conservative ideological framework to catch carefully calculated, subliminally shaped public responses. This framework was pre-fabricated by the strange déjà vu musings of Charles Murray, the American sociologist that exhumed social Darwinism and gave the bones of it originally to Bush and Thatcher to re-cast. Murray’s culture of poverty theory popularised notions that poverty is caused by an individual’s personal deficits, that the poor have earned their position in society, the poor deserve to be poor because this is a reflection of their lack of qualities and level of abilities. Of course, this perspective also assumes that the opposite is true: wealthy and “successful” people are so because they are more talented, motivated and less lazy, and are thus more deserving. Just like the widely discredited social Darwinism of the Victorian era, proposed by the sociologist Herbert Spencer, (who originally coined the phrase “survival of the fittest”, and not Darwin, as is widely held) these resurrected ideas have a considerable degree of popularity in upper-class and elite Conservative circles, where such perspective provides a justification for extensive privilege. In addition, poor communities are seen as socialising environments where values such as fatalism are transmitted from generation to” work-shy” generation. Perhaps that’s why Thatcher destroyed so many communities : in a bid to drive her own demon out. It was invoked by a traditional Tory ritual of blame. Political responsibility was sacrificed, and that’s also a traditional Tory ritual. According to sociologists Kingsley Davis and Wilbert Moore, not only is poverty a reflection of one’s lack of talents, but inequalities are necessary and functional for society. Some positions are socially more important (or functional) than others. Such important positions usually require deferred gratification – sacrifices – to be attained: surgeons need long years of education and dedication to finally practice their crafts. Therefore, it is legitimate that those who make such sacrifices be rewarded with money, power and prestige. Such rewards are offered to motivate the best and brightest to aim for such positions. The poor are poor because they are less intelligent, talented, driven, innovative, motivated, self-restrained and hard working, according to these right wing pretending meritocrats. Of course we know from psychological studies that the “brightest and best” are often driven by greed, narcissism and psychopathic ambition, and that the genuinely brightest and best are very often less well financially rewarded for more virtuous and intelligent behaviours. The salary/pay differences between nurses and footballers is a good example that highlights the myth of meritocracy. We reward good eye and foot coordination skills and prize them far more highly as a society than we do caring and health care skills. How we organise socially (which is shaped considerably within a dominant paradigm of competitive individualism, and a Conservative Neo-liberal economic framework) and how we endorse and reward behaviours as a society is also a big factor in the distribution of competitive (as opposed to cooperative), greedy, narcissistic (as opposed to empathic), psychopathic traits in those holding the most financially rewarding positions of power. Blame-the-victim theories of poverty assume that all individuals think alike independently of their social context and circumstances. They ignore the actual resilience and ingenuity that people in absolute poverty mobilise in order to simply survive. And these theories also ignore the tremendous social obstacles that block people’s path to prosperity, such as war or political and ethnic repression. They ignore, in particular, the crucially significant role that Government decision-making and policy plays in shaping inequalities, and the distribution of wealth. An overview of the underhanded, not the underclass. In the consultation, material deprivation was mentioned almost in passing. Of course Iain Duncan Smith memorably said recently that poverty isn’t caused by a lack of money. Oh really? Hmmm… I suppose if you are stranded on a desert island, then it isn’t, but that’s not applicable here as a line of reasoning, Iain. Although I have seen many impoverished souls amongst the rich, I have yet to see a materially deprived wealthy person. Gosh, I’m surprised you didn’t know that the elite do tend to accomplish avoiding vagabondage and pauperism with aplomb, Iain. Other “causes” of poverty outlined in the document include “worklessness” , unmanageable debt, poor housing, parental skill level, family stability, and quality education, substance abuse and addiction….and it’s sounding like a C. Murray mantra to me. Tory ritualistic chanting again. Yet these ideas have become tacitly accepted socially through a right wing agenda, politicised vigorously and relentlessly, and given pseudo- credibility in the largely right wing media. Inequality in Britain today is now so stark, yet there is remarkably little public concern or anger about poverty. (But plenty of anger about the “feckless” poor). Indeed, compassion and concern for the poorest in society has declined substantially due to the sustained and increasing prevalence of the view that poverty is largely caused by laziness and is the fault of the individual, and that is also simply a shruggable, unavoidable fact of life. It’s not a generous or an expansive view of human nature, from the Tory ontological camp. Moreover, much of the British public believes that there are sufficient opportunities to succeed for those who try hard enough, and also that it is the middle class which actually struggles the most, economically. These assumptions are highly Conservative, ideologically, with political implications that limit public support for egalitarianism and extensive wealth redistribution from rich to poor, and stifle empathy and understanding for the victims of poverty. There is also, of course, the fact that many don’t want to think about the issue at all, because it causes discomfort and unease : making poverty visible reminds people on some subliminal level, no matter how much they blame the victim, that poverty could nonetheless happen to anyone. The saying goes that most of us are just a couple of pay cheques away from destitution. It’s an established but nonetheless tacit truth. Competition is threaded throughout the Conservative Neoliberal ideological framework, and the Tories have always been inclined to see society as having a hierarchical organisation and structure. Competitive individualism is an all pervasive social contagion, and has lead to those who have the least feeling that they are competing the most for rapidly disappearing resources. This is why the media propaganda campaigns of the Government have seen success, because the Government, via the media, has tapped into this contagion and constructed scapegoats. Sick and disabled people have been the most negatively labelled and stigmatised by the media, and it’s no coincidence that hate crimes directed at this social group have significantly increased. We see the poor who work hating the poor unemployed, we see the poor unemployed hating poor immigrants, and we see people who are poor and ill saying that they deserve more support than others that are also poor and ill. Yet instead of maintaining divisions, the victims of this Government would do better to organise, cooperate and mutually support each other. There’s a few socialist principles to counter the isolating poverty trance that many of us are in danger of succumbing to. We can’t afford to be dazed. “Divide and conquer” as a propaganda strategy has certainly been effective , and whilst the authoritarian diversionary (middle) finger is being pointed in blame at the poor and the vulnerable, the real villains are stealing all of our money, and stripping away our publicly funded services and support programs, and enjoying huge tax cuts and pay outs as they go. Poverty and wealth do tend to grow together. It’s no coincidence. 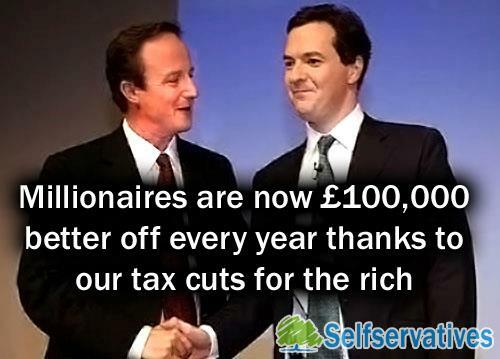 £100, 000 each per year. That is the cause of poverty : utilising social and economic policies to bring about a hugely unequal, grossly unfair and unmerited re- distribution of wealth. In a time of economic recession, jobs are lost, unemployment rates are rising, (despite what we are being told by Cameron – how can we possibly have the best employment rates since the 1960′s, when we are in the middle of the worst global recession we have seen for many decades? ), and businesses are increasingly facing bankruptcy, it is therefore hardly fair to penalise the unemployed. Yet taking money from those who have the least via the “reforms”, sanctions and workfare are the Governments response to the rising unemployment, and to sickness and disability, too. We know that workfare results in even more job losses, because we know that businesses are inclined to get rid of paid workers and replace them with free labour, which comes funded from the tax payer and so increases profits. We know that private companies are driven by the profit motive, and at the best of times ride roughshod over human needs. Add to that the matter of Government targets to ‘incentivise’ businesses through further financial reward – with the political aim of reducing State support for the vulnerable – and we have the most corrupt and inhumane profiting from human misery, with private companies such as Atos being encouraged explicitly to inflict misery, and financially rewarded for inflicting that misery, suffering, sometimes death, and of course, increasing financial hardship and poverty. Sanctions of up to 3 years – stopping a person’s basic means of survival (benefit covers the cost of food and fuel, with housing benefit covering the other basic survival need – shelter) , means that those who cannot find work will quite likely die. That’s a fact. Evidence of this biological fact is well articulated by Abraham Maslow (see Maslow’s Hierarchy.) Maslow also explains clearly how poor people cannot be “incentivised” or “helped” through sanctions and punishment, or motivated by these methods to find none existent jobs when they are struggling to survive. Ask yourself what kind of Government would steal money from the poorest citizens through “reforming” the system of welfare provision, when we are in recession. Then ask again why there is a desire to redefine poverty in a way that excludes the obvious reason for it : a lack of money. One cannot help but wonder why the Coalition think that poor people need money taken from them to “incentivise” them, but very wealthy people need money giving to them, to” incentivise” them. Where did the money come from that rewarded so well those who do not need it ? Oh yes, I can see now…. A simple truth is that poverty happens because some people are very, very rich. That happens ultimately because of Government policies that create, sustain and extend inequalities. Given the Coalitions’ significant contribution to the continuing rise in childhood poverty it’s worth noting their abject failure to meet their obligations to make provision for children at risk from the effects of poverty, because they prefer instead to make provision for those who need it the very least : the already very wealthy. That would be the Government. Many thanks to Robert Livingstone for his brilliant art work. This entry was posted in Economics, Employment, Topical News, Uncategorized, Welfare reform and tagged Herbert Spencer, Iain Duncan smith, poverty, Social Darwinism by adminthinkleft. Bookmark the permalink. I saw a bus (in Glasgow) with an advert saying “1 in 4 children are living in poverty”. Horrendous. However, with the efforts of the Coalition they will be able to cut that – to 1 in 3! BSCPARTY, If you look closely is also the WORLD WIDE ASSOC. of PHILANTHROPISTS.The journey towards Democracy MUST take Philanthropy with it or PEOPLE are not fit to GOVERN themselves.This BLOG is a indepth look at that principle. Ignore it at your PERIL. Yes, cooperation, empathy, egalitarianism, and positive esteem and regard of others, as well as philanthropy are the only way forward. We tried the other, it hasn’t worked. It’s destroyed so much that was only recently decent and civilised. Those things, that are based on rights and equality principles were fought for by our parents, grandparents and great great grandparents. We must fight again, it seems, but fight we must. Let us also spell out where Social Darwinism finally leads by looking at the 1930’s and Germany. this should not be ignored.